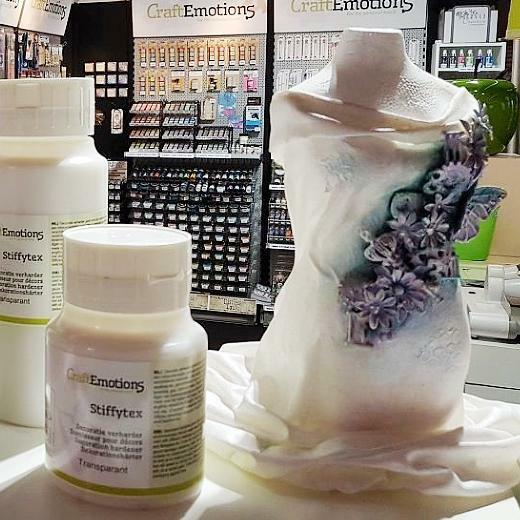 Craft Emotions StiffyTex is an environmentally friendly water-based liquid sculpting medium. StiffyTex is used to harden porous textiles for making sculptures, decorative art, decorative objects and jewellery. It dries to a matte finish. StiffyTex can be used with many absorbent materials such as paper, cardboard, fabrics, leather and fibreglass. StiffyTex can also be combined with self-hardening clays, concrete, stone, ceramic, wood pulp, paper pulp and sand to create different texture finishes. StiffyTex air dries but hot air from a heat embossing tool or a radiator can be used to accelerate the drying time. Once dry your artwork can be decorated with oil or acrylic paints.